The Stihl MS500i Fuel Injection Petrol Chainsaw is the first ever chainsaw with STIHL Injection Technology. The best power-to-weight ratio on the market, and the simplest operation. Ideally suited for the harvesting and processing of large timber. All thanks to its unique lightweight design and outstanding acceleration. New bumper spikes, HD2 filter, captive nut on the sprocket cover for easy chain change, controlled-delivery oil pump, and tool-free fuel cap for safe and easy filling with fuels and lubricants. Very easy to start, whether starting from cold or hot. 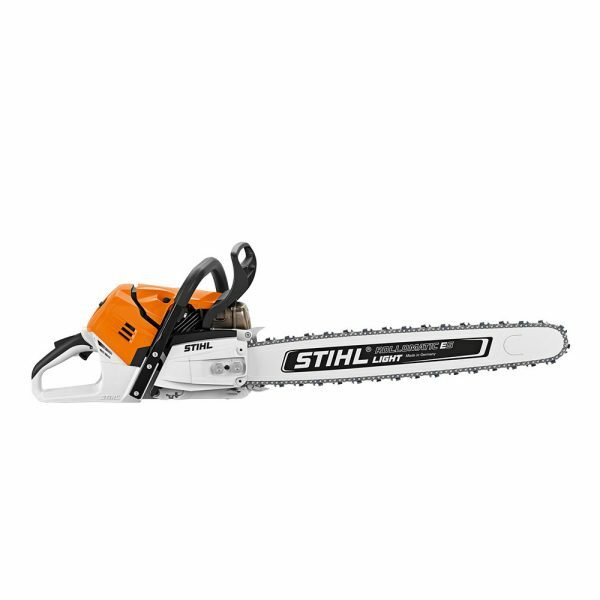 This item is designated by Stihl as requiring a safety hand-over from the dealer, which means that we cannot use a 3rd-party delivery service for this item. We’re very sorry, but if you live outside the areas listed above, we will not be able to send this item to you. Of course, you can always buy the item online, then come and visit us in the shop to collect your items in person, or call us for information on alternative manufactures of equivalent specifications. This policy applies to specific Stihl machines only – you may purchase any other products through this site and have them delivered by a 3rd party delivery service.